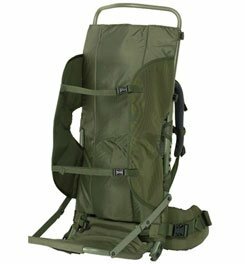 I have used this pack frame to carry out several elk and deer. It is extremely simple to use....fold down the shelf, put the load on it, snap buckles into place, and go. Very comfortable, and the built-in blaze orange rain cover comes in handy when packing out head/antlers. 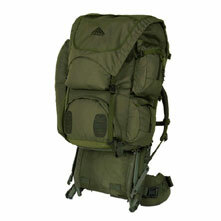 I have ordered the pack bag to add to it for pack-in hunts, and look forward to trying it out. Going for second trip for caribou in Quebec. First trip the guide asked to buy mine or my buddies. He had over 25 years in the bush as a guide. My buddy gave the guide his as a tip and bought another one when he got back to the States. I tried one several other brands, the Kelty had the most stability and the best padding. The waist belt has a very firm foam that compresses under heavy loads and doesn't let the frame dig in. We packed out 8 caribou, and everyone that used the packs loved them. The metal supports for the meat rack seemed to help stabilize the pack more than the nylon straps of other brands. If you are looking for an external frame that will haul anything, no matter shape, size or weight then this is the one for you. I have used it on float hunts and several backcountry camping trips in the wilds of Alaska with zero issues. Examples of what we hauled, firewood, action packers (3 of the 8 gal size), inflatable raft, gear, and the list goes on. The shoulder straps are padded for excellent comfort no matter the weight of the load. The best two features are the hydration sleeve and the amazing shelf to support your load. This year I have added the packbag just to make a great product better. Thanks, Kelty for yet another wonderful product. "Southern hunt in a northern land"
The Kelty Cache Hauler is not available from the stores we monitor. It was last seen May 29, 2016	at CampSaver.com.